3/8" Pilot for Stud Boss Facer"
(ANNOUNCER)>> TODAY, THREE WAYS TO MAKE POWER ON THE CHEAP. 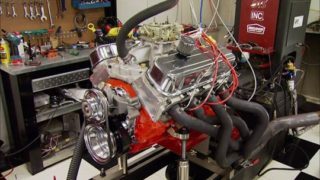 HOW TO PORT AND POLISH STOCK HEADS, HOW TO INSTALL SCREW IN ROCKER ARM STUDS, AND HOW TO BOLT ON A CRANK CASE EVAC SYSTEM. (JOE)>> IF YOU'D LIKE TO FIND UP TO 20 NEW HORSEPOWER IN YOUR OLD ENGINE, YOU'VE COME TO THE RIGHT PLACE. 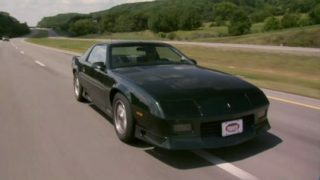 EVERYBODY KNOWS A SET OF HIGH PERFORMANCE ALUMINUM HEADS IS AN EASY WAY TO BOLT ON PERFORMANCE, BUT THEY'RE ALSO GONNA COST YOU $1,000 BUCKS OR MORE. A CHEAPER OPTION, PORT AND POLISH YOUR STOCK HEADS YOURSELF FOR THE ULTIMATE HOMEMADE HOP UP. 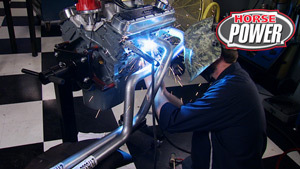 PORT AND POLISH WORK IS A SPECIALTY OF MANY HIGH PERFORMANCE MACHINE SHOPS FOR RACE AND STREET APPLICATIONS. PRODUCTION INTAKE PORTS CAN HAVE FLAWS LIKE CASTING BUMPS THAT CHANGE A SMOOTH AIR FLOW INTO TUMBLING AND TURBULENCE. TURBULENCE IS EVEN WORSE WHEN AIR PASSES THE USUALLY SHARP EDGES OF THE SHORT SIDE RADIUS. REMOVE THE BUMPS AND SMOOTH THE RADIUS AND YOU'VE GOT BETTER FLOW. FLOW BENCH TESTS INVARIABLY SHOW IMPROVEMENTS AT LOW, MEDIUM, AND HIGH VALVE LIFT. OF COURSE PROFESSIONAL PORT POLISHING COST UP TO $600 BUCKS. THE TRADE OFF, WELL YOUR TIME, 10 TO 12 HOURS, BUT THIS COULD BE THE BIGGEST BANG FOR YOUR BUCK PROJECT THAT YOU HAVE THE SATISFACTION OF DOING YOURSELF. WHAT YOU'LL NEED TO GET IS AN ASSORTMENT OF STONES AND CARTRIDGE ROLLS IN VARIOUS SIZES. NOW WE GOT THESE IN A KIT FROM MISTER GASKET. (MIKE)>> THIS IS A CARBIDE BURR SET THAT YOU WANT TO HAVE AROUND IF YOU PLAN ON REMOVING A LOT OF MATERIAL FROM YOUR HEADS AT THE VERY BEGINNING. NOW AT THE END, TO GET A NICE, SMOOTH FINISH, A CROSS BUFF KIT IS ALWAYS GOOD TO HAVE. AND TO SPIN ALL OF THOSE YOU WANT A NICE DIE GRINDER THAT FITS YOUR HAND GOOD THAT YOU CAN CONTROL. YOU ALSO WANT EAR PROTECTION, A GOOD SET OF GLOVES, AND SOME BREATHING PROTECTION. THE MOST IMPORTANT THING TO HAVE FOR THIS WHOLE JOB IS A GOOD SET OF SAFETY GLASSES. NOW THESE CAME FROM SEVEN EYE AND IT'S THEIR BALI DESIGN. THIS INSERT GOES IN THE BACK SIDE LIKE THIS AND WHEN ON, NO METAL CAN GET IN FROM THE TOP, THE BOTTOM, OR THE SIDES. SO YOUR EYES ARE ALWAYS PROTECTED. 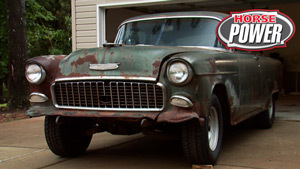 FOR OUR PORTING PROJECT WE'RE USING STOCK IRON HEADS FROM AN OLD CHEVY 350, WHICH WE NEED TO COMPLETELY DISASSEMBLE. NOW THIS IS IMPORTANT. BE SURE TO MARK THE VALVES SO THEY GO BACK WHERE THEY BELONG WHEN YOU'RE READY TO REINSTALL THEM. (JOE)>> MAN JUST LOOK AT THESE INTAKE VALVES. IMAGINE WHAT THOSE DEPOSITS ARE DOING TO THE FUEL RIGHT BEFORE IT ENTERS THE COMBUSTION CHAMBER, NOT GOOD! AND THE HEADS, WELL ALL THAT CARBON BUILD UP COULD GUM UP YOUR GRINDING CARTRIDGES AND PREVENT THEM FROM REMOVING METAL. THERE'S NO WAY TO GET THEM THOROUGHLY CLEAN WITH SOLVENT AND A WIRE BRUSH, SO WE'RE USING OUR SHOP'S SONIC CLEANER. 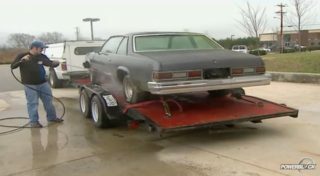 BUT FOR $20 BUCKS, A HOT TANK TREATMENT AT A MACHINE SHOP WILL GIVE YOU THE SAME RESULTS. WHILE THE HEAD'S COOKING, HERE'S SOMETHING TO THINK ABOUT. IF YOU GET GOOD ENOUGH AT IT, YOU COULD PORT AND POLISH YOUR WAY TO A NEW CAREER. RENOWN ENGINE BUILDER JOE MONDELLO HAS A SCHOOL WE VISITED WHERE THIS IS A MAIN PART OF THE CURRICULUM. NOW JOE FIRST TEACHES HIS STUDENTS TO CONTROL THE GRINDER AND NOT LET IT CONTROL THEM. (JOE M.)>> COME ON BY THE BACK SIDE HERE A LITTLE BIT. A LITTLE MORE MOVEMENT BACK AND FORTH, PERFECT, GREAT! (MIKE)>> AFTER THE HEADS ARE CLEAN AND DRY, WE NEED TO BRING THE INTAKE SURFACES DOWN TO BARE METAL. NOW A SCOTCHBRITE PAD IS THE QUICKEST, MOST EFFICIENT WAY TO GET IN THERE. ALRIGHT, NOW IT'S TIME TO GET DOWN TO BUSINESS, AND THE FIRST STEP IS OPENING THE INTAKE PORTS TO MATCH THE GASKET. COME OVER HERE, I'LL SHOW YOU WHAT I MEAN. WITH THE GASKET RIGHT WHERE IT NEEDS TO BE, YOU CAN SEE THE AMOUNT OF MATERIAL WE HAVE TO REMOVE FROM THE INTAKE PORTS. (JOE)>> COVER THEM WITH MACHINIST BLUE OR DIE CHEM. BOLT ON A NEW GASKET, WE'RE USING MISTER GASKETS, AND SCRIBE AROUND THE INSIDE EDGE OF THE GASKET. (MIKE)>> YOU WANT TO HAVE YOUR GRINDER'S SPEED BETWEEN 10,000 AND 12,000 RPMS OR YOU'RE GONNA BURN UP ALL YOUR CARTRIDGE ROLLS. NOW MOST DIE GRINDERS WILL RUN WIDE OPEN ABOUT 18,000 RPM. NOW YOU CAN REGULATE THEM THREE DIFFERENT WAYS. THE FIRST ONE IS AT THE AIR TANK ON A VALVE. THE SECOND WAY, AN EXTERNAL REGULATOR MOUNTED RIGHT AT THE BACK SIDE OF THE TOOL. OR LIKE WE'VE GOT, AN INTERNAL REGULATOR BUILT INTO OUR MATCO DIE GRINDER. NOW IF YOU LISTEN, YOU'LL SEE WHAT I MEAN ABOUT THE SPEED. ( die grinder spinning ) NOW ABOUT HALF WAY DOWN, YOU'RE IN THE BALLPARK. (JOE)>> WE'RE GONNA START WITH THE STONE IN OUR GRINDER, AND THE IDEA IS TO REMOVE THE MATERIAL INSIDE THE SCRIBE MARKS. THEN HERE'S WHERE SOME FINESSE COMES INTO PLAY. YOU WANT TO BLEND OR FEATHER THE NOW LARGER PORT AND ONLY GRIND ONE TO ONE AND A HALF INCHES INTO IT. REMEMBER, IT'S BETTER TO GO OVER IT SEVERAL TIMES MODERATELY THAN WITH ONE HEAVY PASS, OR ELSE YOU COULD TURN YOUR HEAD INTO A HEAVY PIECE OF JUNK. (JOE)>> NOW THAT THE ENTRY PORT'S ENLARGED, YOU WANT TO SWITCH TO THE LESS COURSE CARTRIDGE ROLLS TO SMOOTH THINGS OUT, GO IN A LITTLE FURTHER. YOU MIGHT START WITH A 40 GRIT FOR THE FIRST PASS, THEN CHANGE TO AN 80 GRIT TO FINISH UP. (MIKE)>> NOW FOR THE OTHER SIDE OF THE RUNNER YOU WANT TO BE REALLY CAREFUL NOT TO GET INTO THE VALVE SEAT AREA AT ALL OR YOU'RE GONNA SPEND THE EXTRA MONEY FOR A VALVE JOB. NOW YOU CAN SEE A LOT OF ROUGH CASTING DOWN IN THIS AREA. WE'RE GONNA GET RID OF ALL OF THAT. AND UP HERE ON THE SHORT SIDE RADIUS, THERE'S A RIDGE AND A LITTLE RISE. WE'RE GONNA GET RID OF THAT AND MAKE IT A NICE, SMOOTH TRANSITION. (JOE)>> UNLESS YOU SEE ROUGH CASTING BUMPS, YOU DON'T WANT TO WORK ON THE AREA BETWEEN HERE AND THE PORT OPENING. THAT MIDDLE AREA NEEDS TO STAY COURSE TO PROMOTE FUEL ATOMIZATION. IT MAY TAKE A COMBINATION OF STONES AND CARTRIDGES TO COMPLETE THE RADIUS AND BOWL WORK. MOSTLY IT'LL TAKE TIME, SO BE PATIENT. SINCE ATOMIZATION ALSO OCCURS IN THE BOWL AREA, WHILE YOU WANT TO GET RID OF ANY CASTING BUMPS, YOU WANT TO LEAVE IT A LITTLE ROUGH TO THE TOUCH. THE LAST STEP, KNOCKING DOWN THE SHARP EDGES OF THE VALVE GUIDE. SO BY WORKING INDOORS AND SITTING DOWN, YOU WENT FROM THIS TO THIS. LOOKS BETTER, OUGHT TO FLOW BETTER, AND WELL WE ONLY HAVE SIX MORE TO GO. (ANNOUNCER)>> NEXT, HOW TO PUT A MIRROR LIKE FINISH ON EXHAUST PORTS AND COMBUSTION CHAMBERS. 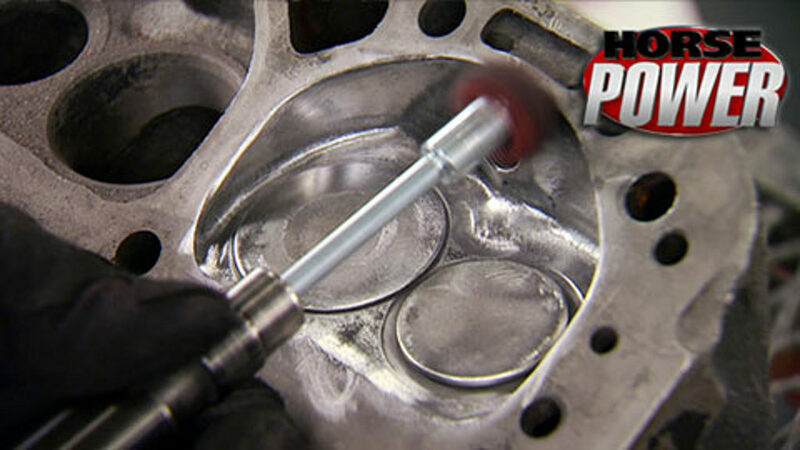 PLUS THE SECRET TO UNSHROUDING EXHAUST VALVES AS WE HELP YOU PORT YOUR WAY TO MORE POWER! 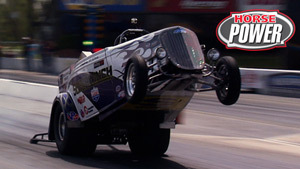 (JOE)>> TODAY WE'RE PORTING OUR WAY TO MORE AIR FLOW IN HOPES OF POLISHING OFF SOME MORE HORSEPOWER. NOW WE JUST SHOWED YOU HOW TO DO THE INTAKE PORTS. NOW IT'S TIME FOR THE EXHAUST. NOW IF YOU'VE NEVER SEEN THE INSIDE OF ONE OF THESE, IT KINDA LOOKS LIKE THE INSIDE OF SOMEBODY'S CHIMNEY, PRETTY NASTY. THE FIRST STEPS ARE THE SAME WITH DIE CHEM BLUING ON THE SURFACE, SCRIBE INSIDE THE GASKET. THEN ENLARGE THE PORT OPENING TO MATCH THE GASKET, FOLLOWED BY THE CARTRIDGES TO SMOOTH OUT THE WALLS. UNLIKE THE INTAKE PORT, WHERE WE NEED A LITTLE ROUGHNESS FOR ATOMIZATION, WE NEED TO WORK THE EXHAUST PORTS ALL THE WAY THROUGH. THAT'S BECAUSE CARBON AND RUST AN BUILD UP ON THE WALLS AND IMPEDE EXHAUST FLOW. WE HAVE THREE MORE STEPS TO GET THAT REALLY SLICK, SHINNY FINISH WE WANT. FIRST A FLAPPER FROM OUR MISTER GASKET KIT. THEN WE LOAD UP A MEDIUM GRIT CROSS BUFFER. 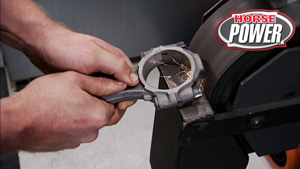 AND THESE ARE VERY SENSITIVE TO GRINDER SPEED, SO KEEP IT AT ABOUT 10,000 RPM. THE LAST STEP, CHANGE TO A FINE GRIT BUFFER. WE APPARENTLY DON'T NEED IT, BUT YOU CAN USE WD 40 AS A LUBRICANT TO HELP THE BUFFER GIVE A FINAL FINISH. WELL NOW LETS FLIP IT OVER AND WORK ON THE COMBUSTION CHAMBER SIDE. AGAIN, GOTTA BE CAREFUL NOT TO TOUCH THE VALVE SEAT. HERE'S WHERE WE NEED A MORE POINTED CARBIDE BIT JUST TO GET INTO THE CREVICE BETWEEN THE WALL AND THE VALVE GUIDE. THEN SMOOTH IT OUT WITH CARTRIDGE ROLL BEFORE BUFFING AND POLISHING. THE COMBUSTION CHAMBERS ALSO NEED THAT NEAR MIRROR FINISH FOR A COUPLE OF REASONS. FIRST, THE CARBON DEPOSITS, BUT ALSO TO GET RID OF SHARP EDGES THAT COULD CAUSE PREIGNITION. NOW BEFORE YOU JUMP IN WITH THE GRINDER THOUGH, HERE'S AN IMPORTANT TIP. INSTALL A COUPLE OF JUNK INTAKE AND EXHAUST VALVES THAT FIT TO PROTECT THE VALVE SEATS. ZIP TIES ON THE STEMS WILL KEEP THEM IN PLACE. NO REASON TO USE THE STONE HERE UNLESS YOU NEED TO UNSHROUD THE VALVES. START WITH A CARTRIDGE ROLL TO SMOOTH THE EDGES WHERE THE CHAMBER MEETS THE DECK. THE MOST IMPORTANT THING TO REMEMBER IN COMBUSTION CHAMBER WORK IS REMOVE AS LITTLE MATERIAL AS POSSIBLE. EVERY BIT OF METAL YOU TAKE AWAY INCREASES CHAMBER DISPLACEMENT, AND REDUCES COMPRESSION RATIO, WHICH ALSO REDUCES POWER. BEFORE YOU PUT THAT GRINDER AWAY THOUGH, CHECK YOUR WATER JACKETS. OURS ARE OKAY BUT IF YOU'VE GOT DEPOSITS LEFT IN HERE, YOU CAN IMPROVE COOLING BY GETTING RID OF IT. (MIKE)>> WHEN WE REASSEMBLE OUR HEADS, WE'RE GONNA REUSE THE ORIGINAL VALVES. 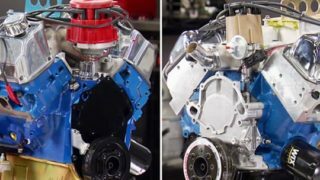 NOW INSTEAD OF SPENDING A BUNCH OF MONEY AT THE MACHINE SHOP TO GET A COMPLETE VALVE JOB DONE, HERE'S THE NEXT BEST WAY YOU CAN DO IT AT HOME AND SAVE SOME MORE CASH. NOW IT'S CALLED VALVE LAPPING, AND WHAT YOU'LL NEED IS SOME LOCTITE LAPPING COMPOUND, OURS IS FINE GRIT, A LAPPING TOOL, WHICH IS BASICALLY A SUCTION CUP ON THE END OF A HANDLE, AND SOME DIE CHEM LAYOUT FLUID TO GET A GOOD VISUAL OF THE WORK YOU'RE GONNA DO. THE FIRST STEP IS BRUSHING SOME DIE CHEM ON THE VALVE SEAT. THIS WILL ALLOW YOU TO SEE THE LAPPING PATTERN AND KNOW WHEN THE SEAL IS GOOD. NEXT UP, PLACE SOME LAPPING COMPOUND ON THE VALVE. NOW SLIDE THE VALVE INTO ITS ORIGINAL LOCATION AND ATTACH THE LAPPING TOOL. WITH A LITTLE PRESSURE, START WORKING THE TOOL BACK AND FORTH LIKE YOU WOULD WARM YOUR HANDS. NOW AFTER ABOUT 20 TO 30 SECONDS PULL THE VALVE FROM THE SEAT AND LOOK AT THE PATTERN YOU MADE. IF THERE IS A SHINNY SURFACE ALL THE WAY AROUND THE VALVE AND SEAT, YOUR JOB IS DONE. IF NOT, THERE'S A GOOD CHANCE YOU HAVE A BENT VALVE THAT WILL NEED TO BE REPLACED. IF YOU DON'T HAVE A LAPPING TOOL, HERE'S THE NEXT BEST THING, A PIECE OF VACUUM HOSE. JUST STICK THE VALVE IN FROM THE BOTTOM, PUT THE HOSE OVER THE STEM JUST BELOW WHERE THE LOCKS CATCH SO IT HOLDS THE HOSE IN PLACE. PULL A LITTLE FIRM PRESSURE AND THE SAME HAND WARMING MOTION YOU DID BEFORE AND YOU'LL BE ABLE TO LAP YOUR VALVES. GOD I LOVE SAVING MONEY! 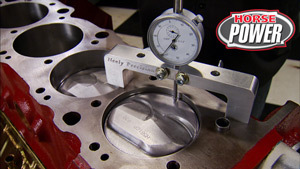 (JOE)>> HORSEPOWER'S BACK AFTER TAKING YOU THROUGH THE STEPS OF PORTING AND POLISHING ONE OF OUR SMALL BLOCK HEADS. FIRST PORT MATCHING AND OPENING UP THE INTAKE RUNNER, THEN COMPLETELY WORKING THE EXHAUST PORTS, FINALLY PUTTING A SLICK FINISH INSIDE THE COMBUSTION CHAMBER. THE DIFFERENCE IN LOOKS IS DRAMATIC, BUT LETS SEE EXACTLY HOW MUCH WE OPENED UP THE INTAKE RUNNER USING THIS BARRETTE WE GOT FROM SUMMIT FILLED WITH COLORED ALCOHOL. FIRST WE'VE GOT TO GET THE HEAD PERFECTLY LEVEL. THEN FILL THE UNPORTED RUNNER FIRST. AND IT TOOK 143cc'S OF FLUID TO FILL IT. OKAY NEXT WE FILL THE PORTED RUNNER, AND IT HOLDS 154cc'S OF FLUID. THAT'S A DIFFERENCE THAT MAKES FOR MORE FLOW AND MORE POWER. OF COURSE THAT'S A PAYOFF THAT COMES ONLY AFTER A LOT OF HARD WORK AND TIME ON YOUR PART. SO TO MAKE SURE THAT TIME'S NOT WASTED, LETS TAKE IT A STEP FURTHER AND PORT MATCH THE INTAKE MANIFOLD. BY NOW YOU'RE FAMILIAR WITH THE FIRST STEPS, LAYING DOWN THE DIE CHEM AND SCRIBING AROUND THE INSIDE OF THE MANIFOLD INTAKE GASKET. SINCE THE INTAKE IS MADE OF ALUMINUM, WE START WITH A WIDE GROOVE CARBIDE BURR TO REMOVE MATERIAL FROM THE PORT ENTRY. SINCE ALUMINUM IS SOFTER THAN IRON, TAKE IT EASY KEEPING THE TOOL MOVING WITH VERY LITTLE PRESSURE AND USE PLENTY OF WD 40. HERE'S A WAY TO INSURE AND EVEN PATH INTO THE PORT. BEND A PIECE OF WELDING WIRE TO MATCH THE HORIZONTAL AND VERTICAL MEASUREMENTS OF THE GASKET. THIS'LL HELP YOU KEEP THE DIMENSIONS ACCURATE IN THE PORT AS YOU GRIND. SO YOU JUST GRIND, MEASURE, GRIND, UNTIL EVERYTHING'S EVENLY ENLARGED. WELL YOU ALREADY KNOW THE NEXT DRILL. BLEND THE RUNNER WITH CARTRIDGE ROLLS FOLLOWED UP BY BUFFERS. CHECK THE DIFFERENCE, LIKE COMPARING CORN GRITS TO GRAVY. AND YOUR COST TO DO THIS HEAD AND INTAKE WORK? WELL THE PORT/POLISH KIT, HOT TANKING, AND GASKETS ADD UP TO RIGHT AT $100 BUCKS. 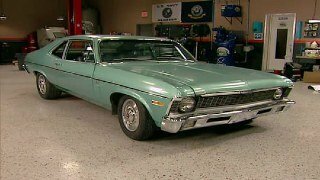 COMPARE THAT TO ABOUT $700 BUCKS FOR A PROFESSIONAL JOB, MONEY YOU CAN SPEND ON FUN STUFF LIKE A HOT CAM, VALVE TRAIN, CARBURETOR, WHEELS, YOU'LL THINK OF SOMETHING. (MIKE)>> CAN YOU BELIEVE GM'S MADE OVER 90 MILLION SMALL BLOCK VEIGHTS SINCE THEIR DEBUT IN 1955? WELL THEY KEEP MAKING A GOOD THING BETTER, BUT IF YOURS WAS BUILT BEFORE 1970, HERE'S SOMETHING THAT NEEDS TO BE ADDRESSED. IF YOU PLAN ON PUTTING A BIGGER CAM SHAFT AND STIFFER SPRINGS IN THE CYLINDER HEAD, YOU COULD RUN INTO A PROBLEM. 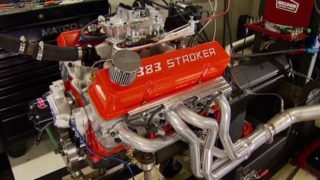 THE FACTORY ROCKER ARM STUDS ARE PRESSED IN WITH AN INTERFERENCE FIT, AND THEY'VE BEEN KNOWN TO PULL OUT AT HIGH RPM'S. SO TO FIX THE PROBLEM WE'RE GONNA REPLACE THEM WITH THESE NEW STRONGER ARP SCREW IN STUDS, BUT FIRST WE HAVE TO PULL THE ORIGINAL STUD. NOW TO DO THAT WE'RE GONNA USE THE STUD PULLING TOOL WE GOT FROM GOODSON, AND A COUPLE OF EXTRA WASHERS BECAUSE OF THE HEIGHT OF THE STUD. NOW USING THE ORIGINAL ROCKER NUT, YOU CAN PUT THAT ON AND TIGHTEN IT DOWN. NOW AS IT TIGHTENS, IT'LL PULL THE STUD OUT. (MIKE)>> AT THE DRILL PRESS AND WITH THE HEAD LEVEL, USE A THREEEIGHTS DRILL BIT TO ENLARGE THE STUD BORES. NOT TOO DEEP THOUGH, THE INTAKE RUNNERS ARE JUST BELOW THE STUD BOSSES. NOW WE CAN MEASURE THE LENGTH OF THE HEX AND ARM RADIUS ON THE ARP STUD, WHICH IS 340 THOUSANDTHS, AND THAT'S HOW MUCH COMES OFF THE TOP OF THE STUD BOSS TO COMPENSATE FOR IT. FOR THAT WE'RE GONNA USE THE GOODSON RESURFACING TOOL AND A DRILL PRESS. IT HAS A PILOT SHAFT THAT ALIGNS THE DEAD CENTER INTO THE DRILL HOLE. USE A SLOW DRILL SPEED AND LUBRICATE THE CUTTER WITH WD 40 ALONG THE WAY. AGAIN, MAKING SURE THE HEAD'S LEVEL, USE THE NINESIXTEENTHS BY 14 TAP AND YOU CUT THE NEW THREADS INTO THE BOSSES. AND INSTALL THE ARP STUDS WITH LOCTITE SEALANT, AND TORQUE THEM DOWN TO 45 FOOT POUNDS. NOW WHEN YOU FINISH WITH THIS PROCEDURE, YOU'RE GONNA HAVE A HEAD THAT CAN HANDLE A LOT MORE LIFT AND A LOT MORE SPRING PRESSURE, AND YOU'RE NOT GONNA HAVE TO WORRY ABOUT AN OLD STUD PULLING OUT. 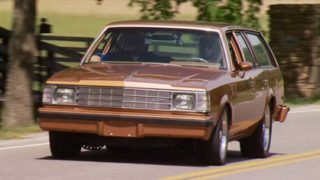 NOW THIS SAME PROCEDURE GOES FOR BIG BLOCK CHEVYS, SMALL BLOCK FORDS, PRETTY MUCH ANYTHING WITH A PRESSED IN STUD. AND BELIEVE ME, IT'S WELL WORTH THE TIME. (ANNOUNCER)>> NEXT, HOW TO FREE UP HORSEPOWER BY PASSING GAS. FROM YOUR ENGINE'S CRANK CASE TO THE EXHAUST THAT IS. IT'S ANOTHER BUILD ON A BUDGET TECH TIP. (MIKE)>> WELCOME BACK! 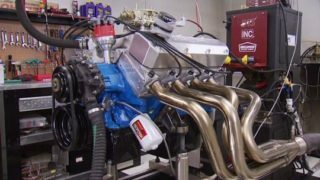 RACE CARS USE EVACUATION SYSTEMS IN THEIR ENGINES TO IMPROVE PERFORMANCE AND REMOVE AN ENGINE ENEMY YOU MAY NOT KNOW ABOUT. CRANK CASE PRESSURE IS CAUSED BY THE MOVEMENT OF PISTONS IN THEIR BORES. THAT PRESSURE CAN LEAD TO OIL BYPASSING THE RINGS AND FOWLING OUT THE PLUGS. INTAKE MANIFOLD SEALS CAN BE BROKEN AND OIL LEAKS AT THE FRONT AND REAR MAINS AND THE OIL PAN ARE COMMON. 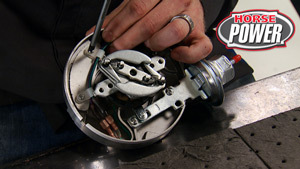 YOU CAN ELIMINATE THE PRESSURE IN YOUR STREET OR STRIP'S ENGINE BY INSTALLING A SIMPLE CRANK CASE EVACUATION SYSTEM. NOW A BASIC KIT WILL END UP COSTING YOU ABOUT $40 BUCKS AND A COUPLE OF HOURS OF YOUR TIME IF YOU HAVE TO REMOVE YOUR HEADERS. ONCE INSTALLED, THE SYSTEM ALLOWS PRESSURIZED AIR TO ESCAPE THROUGH THE SEPARATORS IN THE VALVE COVERS AND ON TO THE EXHAUST HEADER. MISTER GASKET OFFERS THIS KIT WITH OIL SEPARATORS IN THEIR GROMMETS, ONE WAY CHECK VALVES, AND HEADER VENT TUBS, NOT TO MENTION FOUR HOSE CLAMPS. NOW WHAT THEY DON'T INCLUDE IN THE KIT IS FIVEEIGHTHS INCH HOSE THAT YOU'LL BE ABLE TO GET AT YOUR LOCAL AUTO PARTS STORE. YOU START BY DRILLING AN INCH AND AN EIGHTH HOLE IN THE FLAT TOP SURFACE OF BOTH VALVE COVERS. NOW MAKE SURE YOU DON'T DRILL OVER THE ROCKER ARM OIL HOLES. THEN INSTALL YOUR RUBBER GROMMETS AND OIL THE SEPARATORS SO THEY'RE EASIER TO GO IN. LISTEN UP, YOU WANT TO MAKE SURE NOT TO DRILL THE HOLE IN THE VALVE COVER DIRECTLY OVER A ROCKER ARM. THE OIL USED TO LUBRICATE THEM CAN GET PUSHED UP INTO THE OIL SEPARATOR AND SENT DOWN HERE INTO THE HEADER WHERE WE'RE GONNA DO OUR NEXT BIT OF WORK. DRILL A SEVENEIGHTHS INCH HOLE ON THE TOP OF EACH HEADER JUST PAST WHERE THE TUBES TRANSITION INTO THE COLLECTOR. THEN USE A FIVEEIGHTHS SOCKET TO OVAL THE HOLE OUT. NEXT INSTALL THE VENT TUBE SO THE SHARP EDGE FACES THE REAR OF THE COLLECTOR. MAKE SURE THE TUBES ARE ON A 45 DEGREE ANGLE, THEN WELD THEM IN PLACE. AFTER IT'S COOL, SCREW THE CHECK VALVES INTO PLACE AND TIGHTEN THEM DOWN. NOW JUST CONNECT THE RUBBER HOSE TO THE SEPARATOR, TIGHTEN THE HOSE CLAMP, AND YOU'RE DONE, THE PRESSURE'S OFF!